QC Games 4v1 dungeon crawler Breach enters Steam Early Access tomorrow, and there's a palpable excitement in the studio. 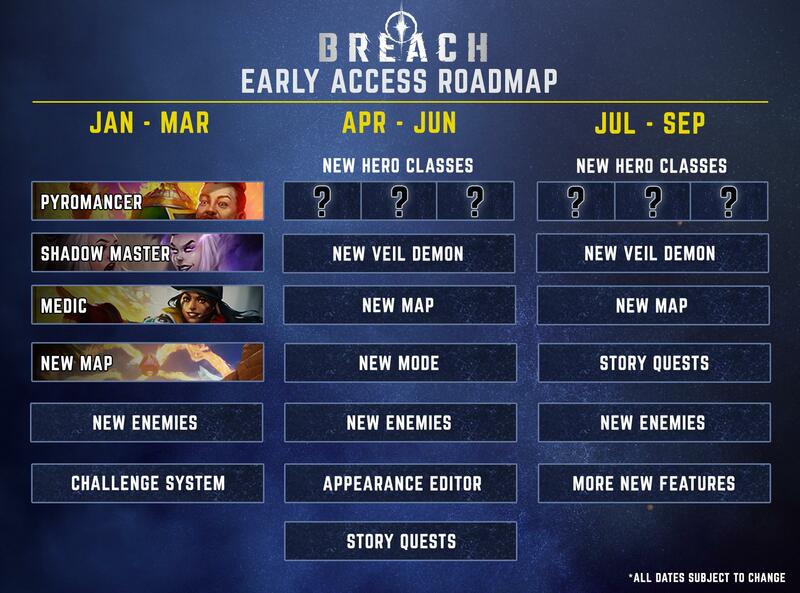 So much that they decided to give a heartfelt thank you to all Breach alpha players and revealed a roadmap for most of 2019. Q1 2019 brings three new classes to join the already interesting roster: Pyromancer, Shadow Master and Medic. A new map is coming as well, and judging by the small cropped image, it seems to be set in some sort of island. New enemies and a challenge system round up this quarter. Q2 brings three more classes, a new veil demon, another new map and a new mode. Story quests seem like an interesting addition, as well as the Appearance Editor – because we've seen many character looking exactly the same during the alpha tests. Finally, Q3 strikes back with… you guessed it, three new classes, a new map and more. If Breach finds its footing during Early Access, it could turn out to be a success story similar to Dauntless – a game that has a loyal crowd and devoted developers that are always frank with their fans.